Welcome to Global From Asia, episode 134 – I’m recording after an amazing “Cross Border Trip” – first of its kind this past Friday with a bit over 20 amazing business people based in Hong Kong, Shenzhen, Guangzhou, Zhuhai, and more! Amazing people like Chris Davey and Benjamin May attended and it was a full day of touring Qianhai Free Trade Zone in Shenzhen, seminars, and networking. We will do more of these day trips on the regular – so check out globalfromasia.com/crossbordertrips for upcoming ones. And now for this week’s show – we are continuing our excursion out of Hong Kong and China – this time in Thailand – let’s dig in. Care to give us a bit of history on how you ended up in Thailand? So company setup, you have a great blog post that covers tons of it – should you do it if you are living in Thailand, or hiring there? What are some of the benefits of setting up there? You should have a parent company overseas, like HK or Singapore? How about the ongoing upkeep costs? Is it the same in every city/region of thailand, or are different areas different? How have you been operating your Thailand company? To give us an example. How about others – care to share how they are using a Thailand structure? How can people find out more about you and what you do? Thanks man! √ Thailand Starter Kit: In-depth guides for people looking to work and live in Thailand. For investors and entrepreneurs I specifically recommend the guide to lawyers in Thailand and the guide to cross-cultural management in Thailand . √ Brewed in Bangkok A podcast about the stories of the people you meet in Bangkok. First 7 episodes are done. People can sign up to be notified when the first season goes live. 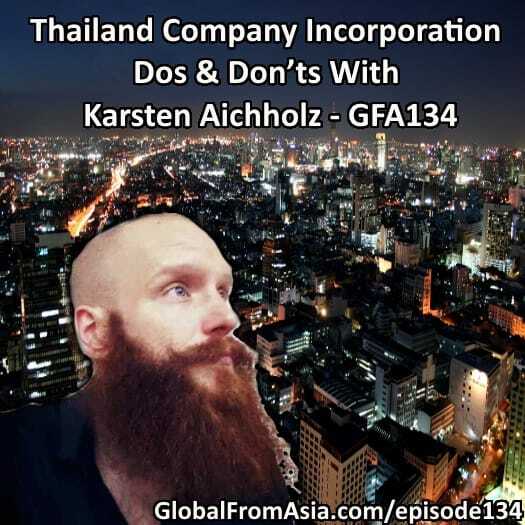 Booyah – there’s our first episode on Thailand company setup and business – thanks for that Karsten. So what are you guys thinking? Last week was Philippines, this week Thailand. Maybe India in the future! That is Asia too right!